This Rebuild Kit is designed specifically to fit 7.6 Liter Maxxforce DT Model Engines (466 cubic inch) produced between 2007-2009. These engines have Serial Numbers that begin with "466H". Coverage for this rebuild kit begins at Engine Serial Number 3,000,000 and continues through 3,300,000 (model year 2009 engines). The piston included with our "Low HP" kit is OE # 1847682C2. 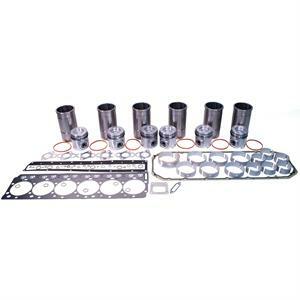 The piston included with our "High HP" kit is OE # 1847683C2. Emission Label: The emission label is located on the top of the rocker cover (valve cover) or intake manifold. The engine model, model year, horsepower rating and torque rating can be obtained from this label. This information is required to determine to correct components for most units built after 1993.